« Warnings on Car Ads: As goes California, so goes the European Union? This entry was posted on Thursday, December 6th, 2007 at 10:33 pm	and is filed under Breaking News Dept.. You can follow any responses to this entry through the RSS 2.0 feed. You can leave a response, or trackback from your own site. You will want to know that Jacob Allderdice has been at it again: first he reads the ALLDERBLOB for an idea, then he "poaches" or otherwise half-bakes it, rewrites it in his own inimitable prose stylings, and fires it off to the Car Advertiser. In the latest case, he scrambled the above Ootes analysis, and dumped it at the Toronto Star. Read it here, if you can stomach it: "Councillor paid high price for votes." 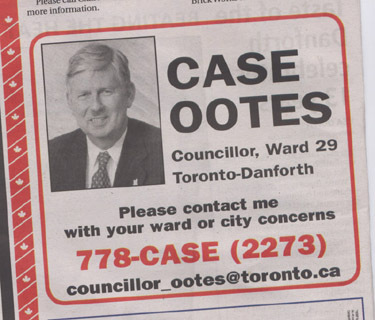 As Royson James establishes, Toronto Councillor Case Ootes (Ward 29) spent tax dollars extravagantly for advertising and self-promotion in 2006. At $15,184 for advertising, plus $20,927 for "postage and couriers," it could be argued that the 20-vote margin that gave Ootes victory over his challenger that year cost $36,111, or $1,800 per winning vote. It falls to your loyal reader to remind Ootes that for all his spending, he actually earned 3,562 fewer votes in 2006 than in 2003. Let's see: He spent $36,000 and lost 3,500 votes. That's about one vote lost for every $10 spent. At that rate, we wish he could have spent another $200 on "advertising." This might have wiped out the last 20 votes that gave him his seat cushion at city hall until 2010.